Shuggie Otis’ new album and tour are covered in the February 2013 issue of MOJO. The magazine tells some of the story behind Inspiration Information / Wings Of Love, Shuggie’s new 2CD deluxe set coming April 16th. 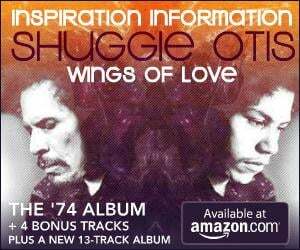 MOJO calls the original Inspiration Information album a “soul-funk psych stew of melodious singing, crisp inventive musicianship and clever songwriting … but only now is Shuggie Otis’ Wings Of Love set to take flight.” The magazine is available on newsstands. Shuggie Otis will headline the SummerStage Showcase at New York’s Highline Ballroom on January 10th! The showcase also will feature People Get Ready, Ofei, Joshua Nelson and DJ Kool Herc. Tickets are available through TicketWeb. Read more at the City Parks Foundation website. New Shuggie Otis tour dates have been announced for 2013 in the U.S., Canada, Mexico, Australia, and Japan! Read more details in the Events section. The history of pop (and by ‘pop’ I mean popular, not top 40 pap) is overflowing with underrated artists, to the point the term has become overused and largely lost its meaning. However, in rare instances, there are those whose talents are impossible to overstate. The phenomenal Shuggie Otis is one such artist. The son of legendary R&B performer and bandleader, Johnny Otis, it would almost be unnatural for Shuggie not to possess some innate talent. Fortunately, his father recognized his nascent gifts and installed his son in his band when he was a mere 12 years old. To hide his age while playing nightclubs, Shuggie would wear dark glasses and a false moustache. As well as being steeped in the musical traditions of jazz, blues, and R&B via his father’s band and musical compatriots, Shuggie (like all kids his age) was taken by the music of his generation. Read more at Aquarium Drunkard.